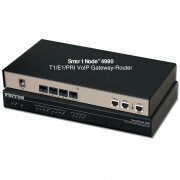 The SmartNode™ 4980 VoIP Gateway-Router allows Enterprises to IP-enable their legacy PBX systems. Evolving from Patton’s award winning SmartNode 4960 Series, the next generation SmartNode 4980 Series comes now with IPv6 upgradeable hardware. 15 to 120 VoIP calls—with up to four T1/E1/PRI ports and dual Gigabit Ethernet ports. VoIP Transcoding Option—Up to 60 channels for WAN bandwidth optimization. QoS and Security—Deliver secure, toll-quality voice communications with Patton’s DownStreamQoS™ with adaptive traffic management and shaping—plus secure voice-over-VPN with AES/DES strong encryption.